Peanut butter and jelly is a timeless combination, one I don’t think I’ll ever tire of, no matter how mature my tastebuds get! 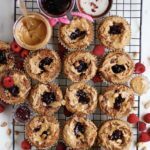 These Peanut Butter and Jelly Muffins with protein are a nutritionally enhanced, grab-n-go take on the classic sandwich, and is a recipe I adapted from Minimalist Baker. 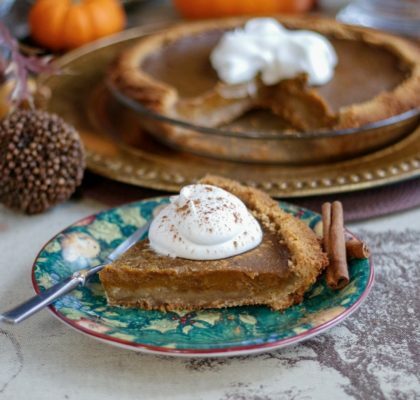 They’re just sweet enough (thanks to the Vitafiber), nutty and filling from the peanut butter, and remain soft and tender on the inside, thanks to the applesauce. Despite all that, my favorite bite is the dead center when it oozes with sweet jelly and creamy nut butter. 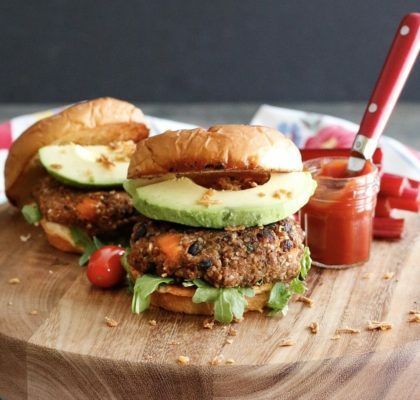 Lately, my body has be craving protein, and since I’m still following a plant-based diet, I’ve been having to use every opportunity I can to get more protein in to my body. Which is why i took the opportunity to incorporate my favorite protein powder, MRM Vanilla Veggie Protein, in place of part of the flour. The peanut flour also adds a boost, as the flour is simply dehydrated peanuts. 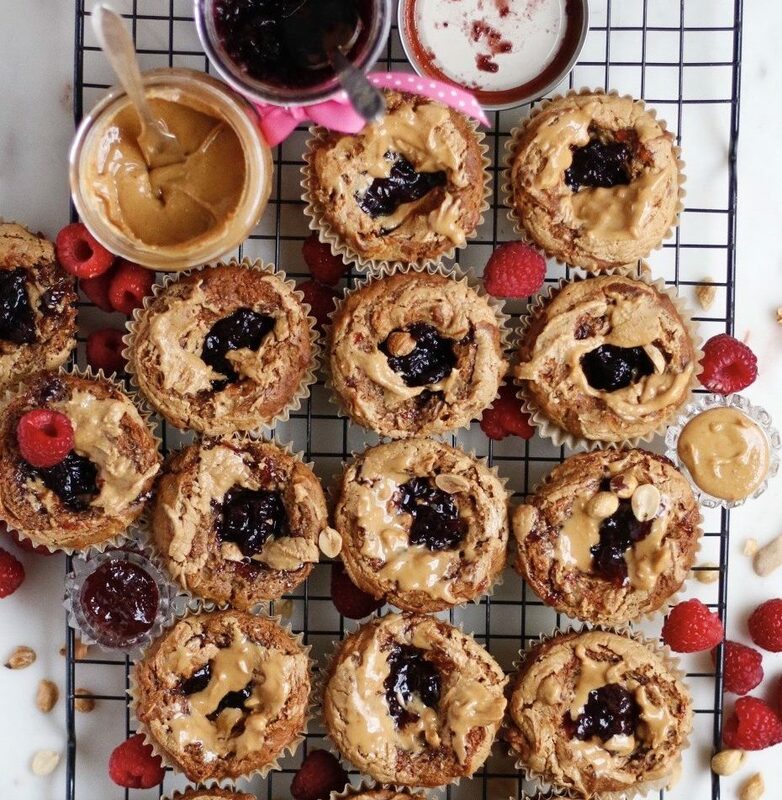 Seeing as these are now the perfect balance of healthy carbs, fat, and adequate protein, these Peanut Butter and Jelly Muffins are the perfect breakfast, snack, or even after-dinner treat- enjoy! A classic flavor combination dressed up in form + nutrition! 1/3-1/2 cup fruit jelly of choice - try to get one without corn syrup! In a large mixing bowl, combine the ground flaxseed and water- allow to sit for 5 minutes. Add in the oil, syrup, Vitafiber, applesauce, peanut butter, and vanilla- stir until evenly combined. Add in all the dry ingredients- stir until mostly mixed, then add in the vinegar and milk and stir one final time until the batter is even (it will be thick). Spoon batter into 14-16 lined or greased muffin tins, filling until 3/4 of the way to the top. 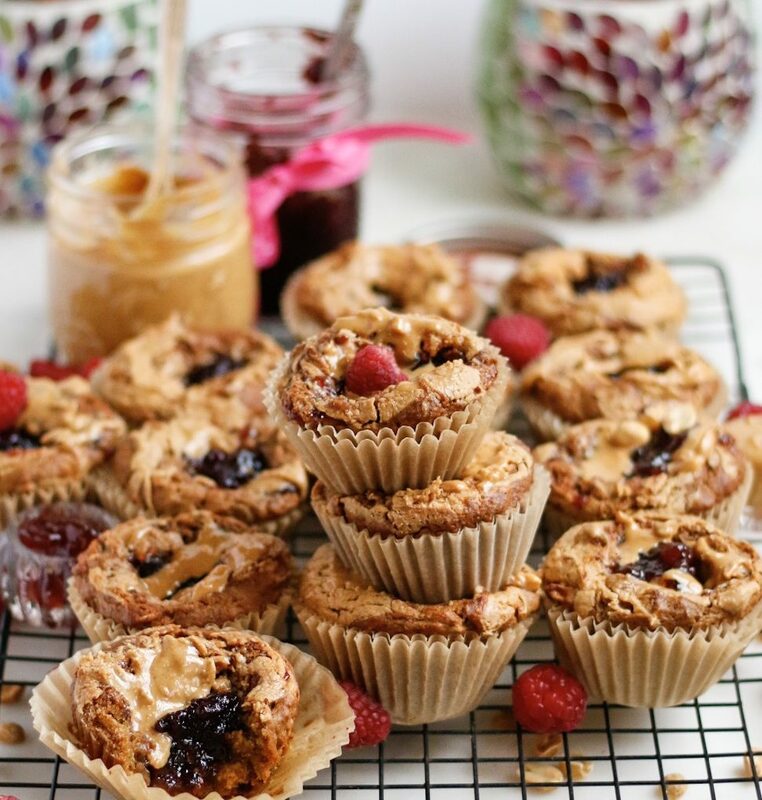 Spoon 1 1/2 tsps each of jelly + additional peanut butter on top of each muffin. Use a toothpick to carefully swirl together, being mindful the jelly doesn't get too close to the edges or it will spill over. Bake 19-23 minutes, until tops are lightly crisp. Allow to cool in muffin tins 5 minutes before transferring to a wire rack to cool. Serve garnished with extra peanuts and fruit, if desired. Store in an airtight container for up to 3 days. *This can be replaced with coconut sugar, beet sugar, brown sugar, or any kind of sugar/sweetener you like! **As I said above, to increase the protein, the apple sauce can be split with Greek yogurt. I have not tried it with ALL yogurt, although I'm confident it would still work, the texture of the muffin just might be slightly drier. ***I used vegetable based protein, which is very thick. Whey protein will likely not result in the same texture muffin, but might still work. Don't care about making them protein muffins? 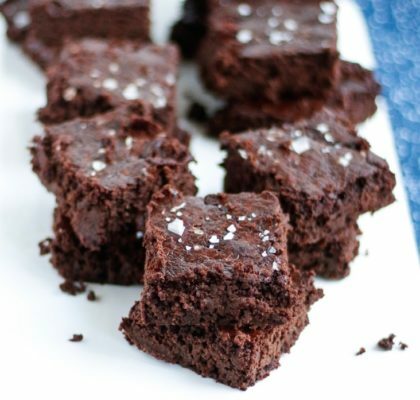 You can replace this 1/2 cup with almond flour or just more all-purpose flour.